I really cannot remember the last time a book touched me the way this one has. 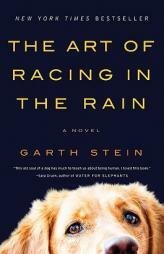 Finished in one day, The Art of Racing in the Rain left me in tears, not of sorrow, but of unbelievable joy. Garth Stein has written a novel so filled with the lessons of life that I think it will take another reading for me to absorb it all. The Art of Racing in the Rain is a narrative. The narrator is a terrier-lab mix named Enzo. Yes, you've read that correctly. He is the much loved dog of Denny Swift, a semi-professional race car driver, whose driving tips turn into analogies of negotiating life's twists and turns. Enzo incorporates and interprets for us the lessons Denny imparts while the two spend hours together watching videos of past races. Enzo's cozy life with Denny changes when Denny meets and marries Eve and then has a daughter named Zoe. He laments the fact that there are now other people in Denny's life, but adjusts to include the newcomers in his circle. The book is filled with Enzo's observations of their family life, his own shortcomings as a dog (he continually bemoans his lack of opposable thumbs) and his wish to come back as a man once his present life is over. When tragedy strikes, and Denny's family is torn apart, Enzo becomes a central figure in helping Denny regain what he has lost. We see the story from a true dog's-eye view, and are all the more emotionally involved because of Enzo's loyalty to Denny, his distress at Denny's predicament, and his lack of ability to help in any constructively human way. When the resolution to his own problems finally occurs, and he is about to embark on a new life, Denny sustains a different kind of loss. Or so he thinks at the time. This was an unbelievably touching story, one that I had to remind myself, repeatedly, could only be total fiction. Mr. Stein becomes Enzo, and then we become him as well. I never forgot that this is a story "told" by a dog. But then again, it never really crossed my mind to question that this is not really possible. That's how real this narrative seems. An excellent book, well worth your time, but do remember the tissues. You'll need them.